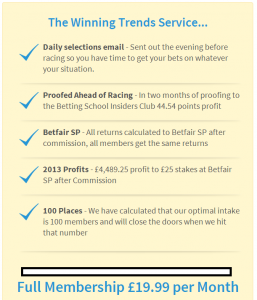 Winning Trends is a service that only operates during the Flat season and we reviewed it at the start of last (2014) season and we were impressed with what we saw from a results perspective, even if the final results weren't as good as they'd have liked them to be. During our 60-day trial, the service had 52 winners from 264 selections for a strike rate of 19.7%. The overall profits of 2.62pts at Betfair SP after commision wasn't really enough for us to approve the service, but was enough to keep me interested in a longer look at it and the results for the whole of 2014 are below the methodology. Winning Trends is the result of many months of research by a guy called Ed Turner and is actually a collection of ten highly profitable micro-systems for backing horses in UK Flat and A/W races, so the selections provided are not "tips" not just another person's judgement of what will win the race, they are purely the stat-based entries of certain trainers. As most of us are aware, trainers are very set in the ways when approaching their training methodologies and Winning Trends have assembled a small portfolio of successful trainer angles that have proved profitable over the years. In 2014, these micro-systems made 74.82pts profit at Betfair SP (no scrambling about to get the best price) and so far this year in just one month has found 16 winners from 76 selections at a strike rate of 21.05%. This year's profit so far stands at 18.53pts, an ROI of 24.4% based on 1pt level stakes bets at win only on betfair. The service is also profitable on a 50/50 win/place basis for those who like a higher strike rate, but the overall profit and ROI are actually very similar both ways. A subscription to Winning Trends is currently priced as a monthly option available at £19.99 per month and this gives you access to the daily selections via a password-protected members website and the selections are also emailed to you on a daily basis. The website is updated the evening before racing and the emails are sent out at the same time, giving members plenty of time/opportunity to place their bets at Betfair SP. The service is also backed up by a no quibble, 30-day money-back guarantee and you have the added protection of payment via PayPal in case of any dispute, not that we foresee any issues! Ernest Anthony will now review Winning Trends for the next 2 months on a win only basis, using a £10 per selection level stake at Betfair SP, deducting a nominal 5% commission from all winning bets. This review started disastrously with a loss of 23.44 points in the first 6 days which would have needed some good results to show a profit in the first 30 days. Having said that on day 7 a profit of 12.67 points was realised and by Day 12 the loss stood at 1.73 points. However this was short lived as the service went at one stage into a 16 consecutive days losing run. By Day 48 the losses stood at 79.74points. Surely there was no way back. From Day 49 - Day 60 this service made a total profit of 65.16 finally finishing with a loss of 14.58 points. Although this service ended with a loss I came to realise that the period when there were 16 consecutive losing days was the period when the going was unpredictable and generally most services also had a losing run. Taking this into consideration perhaps this review should have continued for at least another 10 days as the results improved noticeably once the going settled down. In 2013, these micro-systems made 179.6pts profit at Betfair SP (no scrambling about to get the best price) and so far this year has found 57 winners from 283 selections at a strike rate of 20.14%. 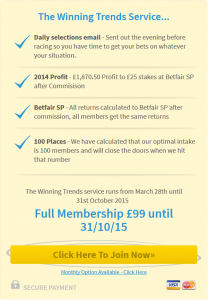 This year's profit so far stands at 62pts, an ROI of 21.9% based on 1pt level stakes bets at win only on betfair. The service is also profitable on a 50/50 win/place basis for those who like a higher strike rate, but the overall profit and ROI are actually very similar both ways.